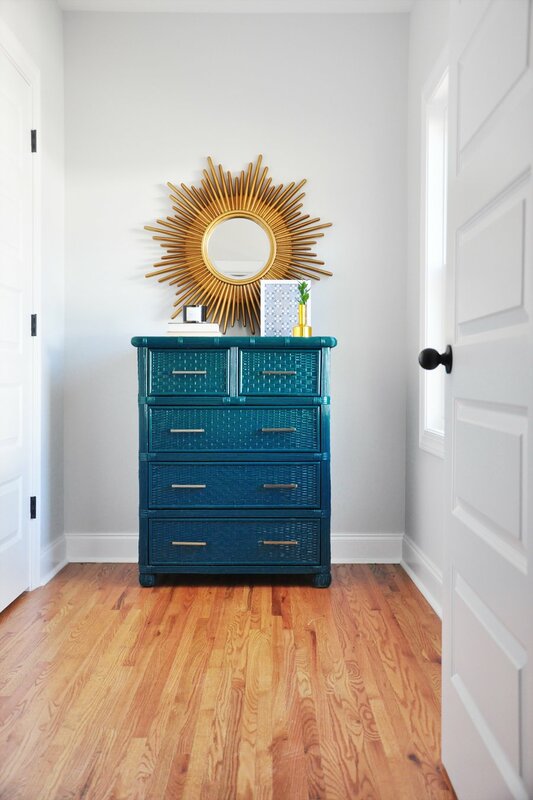 If you’re a compulsive re-decorator like me, you’re always itching for a new house project. Sometimes a simple rearrangement of furniture satisfies my need for a refresh. Other times, however, I need a real change. Buying new furniture is rarely an option, with budgets and all – not to mention simple common sense. 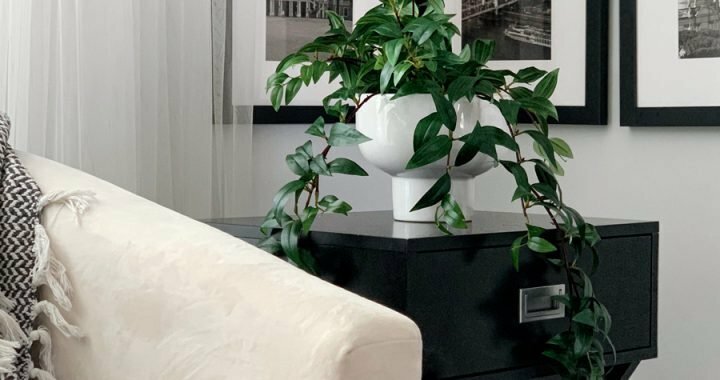 Thankfully, you can quickly and inexpensively update your home without buying new furniture – because ain't nobody got the time (and money!) for that. 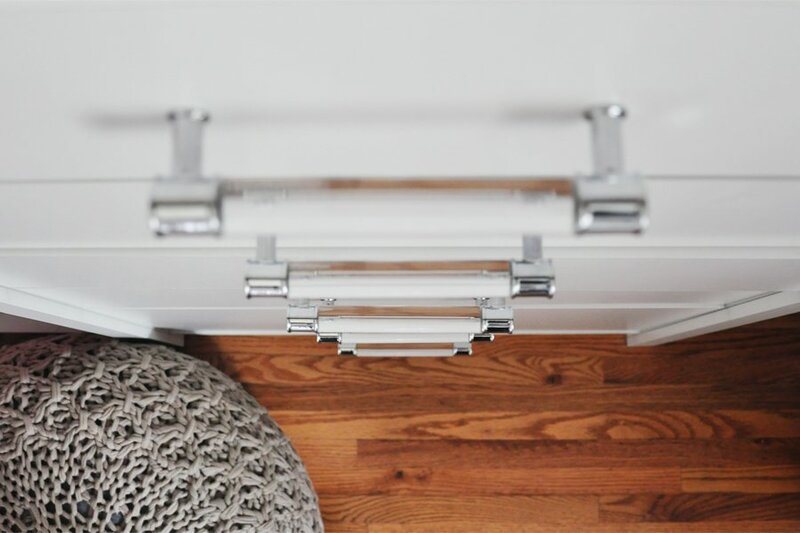 I’m talking about a very simple DIY project: updating hardware pulls and handles. 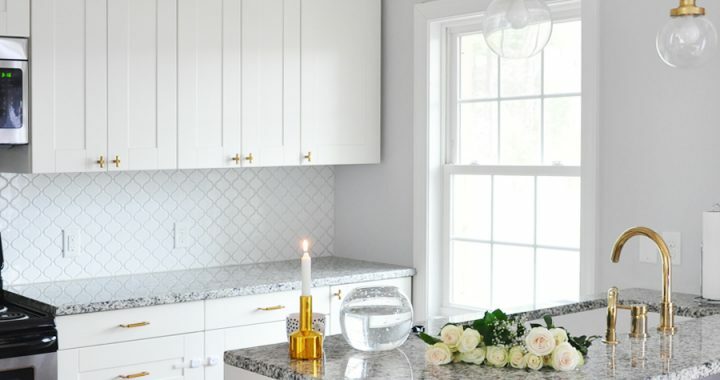 Here's why you should: Hardware instantly adds personality to your kitchen, bathroom or furniture. Hardware is to furniture what accessories are to outfits; you could be wearing the most basic T-shirt and jeans, but with the right accessories, you could look like a million bucks. What's wrong with my current pulls and handles, you ask? Most fairly affordable furniture comes with very basic hardware that does very little for the piece design-wise. There’s no monetary incentive for a manufacturer to install high-quality, specialty hardware but to sell the item at a low price. The same principle applies to kitchens and bathrooms; builder-grade homes use the cheapest hardware available. 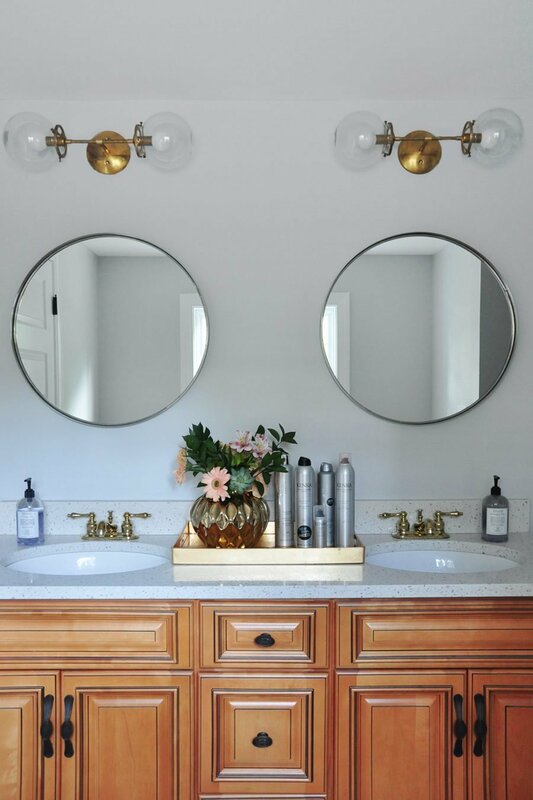 But updated hardware is like an instant facelift, giving your home a totally custom look. 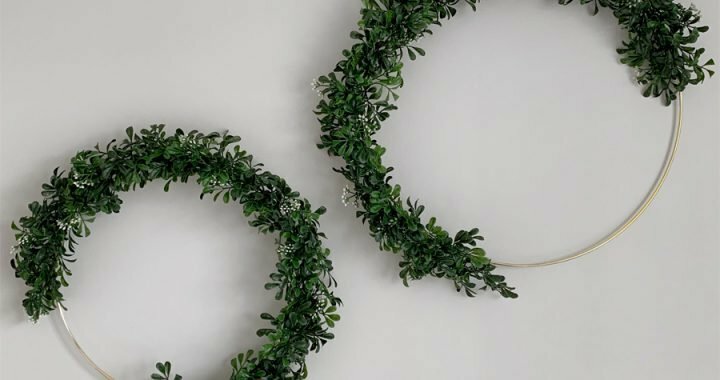 In light of the recent warmer temperatures, longer daylight hours and the long-awaited sunshine, I've become restless with our current decor and needed some sort of change. 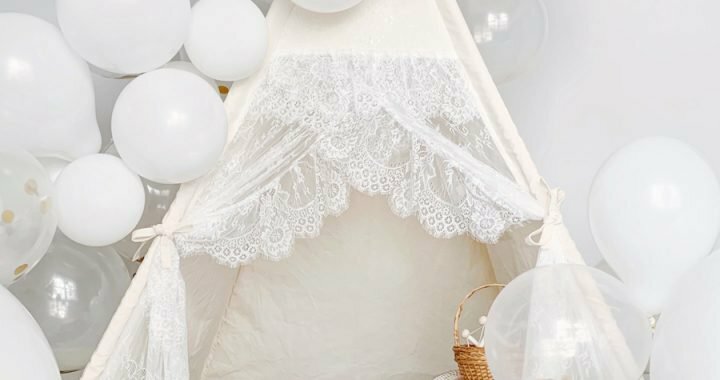 But at this phase of life I am being pulled in a million different directions every day, so I knew tackling a major project like the One Room Challenge wasn’t an option. Instead, I am slowly easing myself back into DIY land by starting with a simple DIY project: updating various hardware around our home. Yet this small change makes such a huge impact, as you’re about to see for yourself. 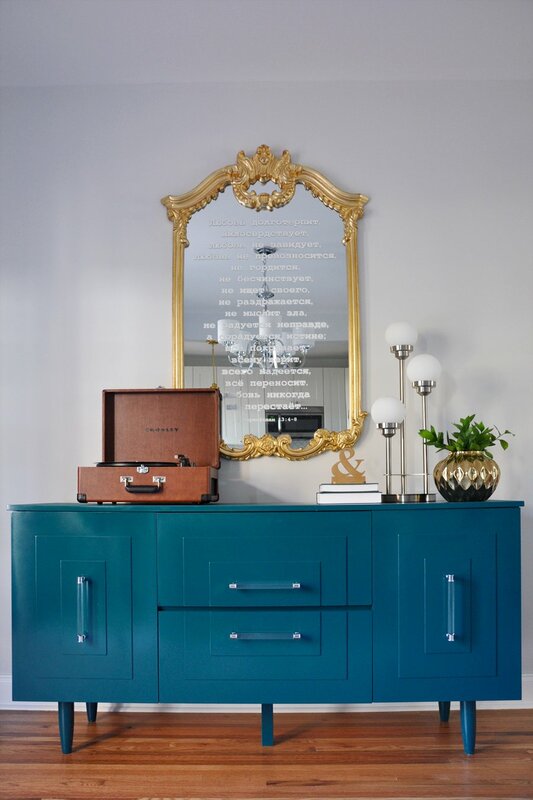 Granted, this credenza underwent a color change, too, but look how the pulls instantly elevate the design! I remember falling in love with a similar Art Deco-style credenza – except the one I was eyeing fell around $2-4K. Yes, you read that right. Four thousand dollars for a dining room credenza. I kid you not, see for yourself! 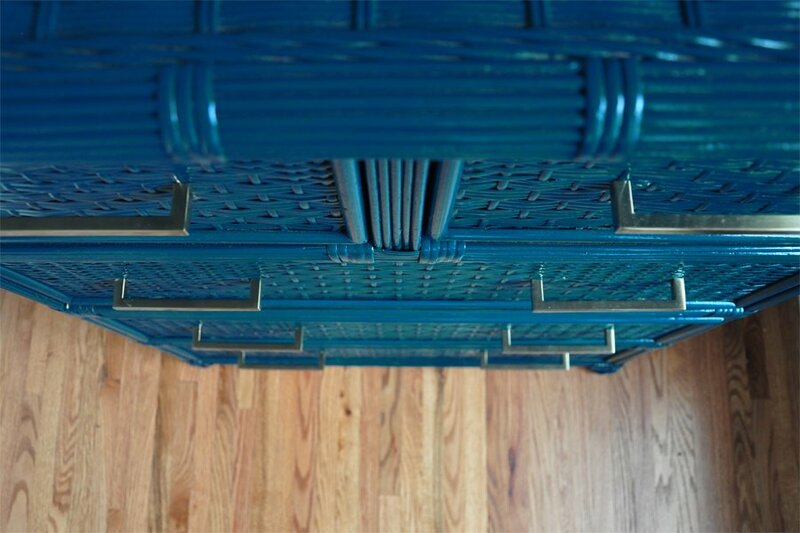 I used the "Midway" cabinet pull from Hickory Hardware to update a simple buffet that I bought ages ago from Overstock, and it seriously looks just as good as the pricey version. Wouldn't you agree? 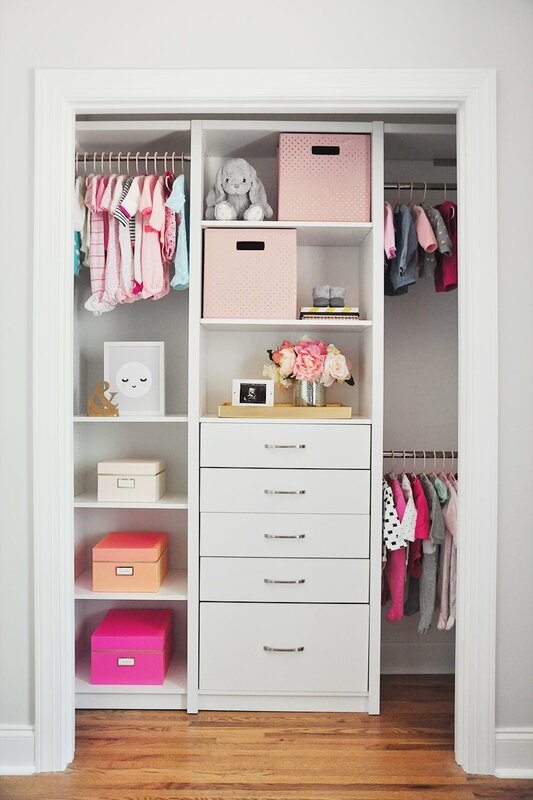 When I was first designing Mila's nursery for the One Room Challenge, I worked with ClosetMaid to create this custom, built-in closet. I accidentally requested the wrong pulls when putting in my order, however, and have been dreaming of updating them since then. 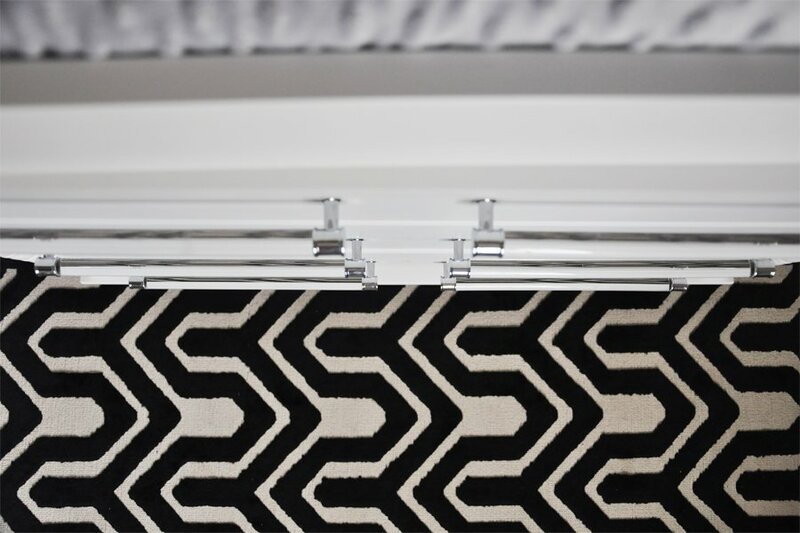 The closet design was totally inspired by Ali Fedotowsky's super glamorous nursery closet, so the acrylic "Midway" pulls seemed appropriate, too. 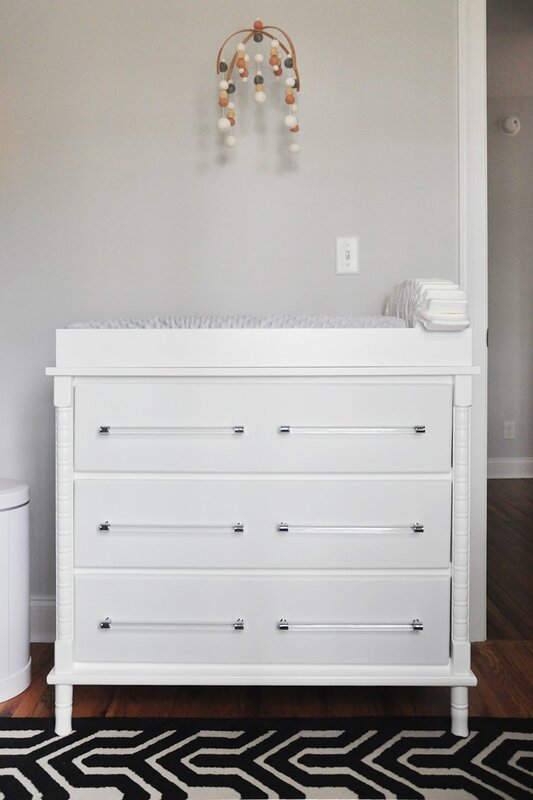 Continuing with the nursery, to tie in the closet with the rest of the furniture in the room, I installed the "Midway" pulls – this time the 12-inch option – on the dresser, too. This update was about more than just aesthetics, however. I found myself getting annoyed when trying to open the drawers using the tiny knobs. To make the dresser more functional, something more substantial was needed. I'm sure you're ready to see something besides the "Midway" collection, am I right? 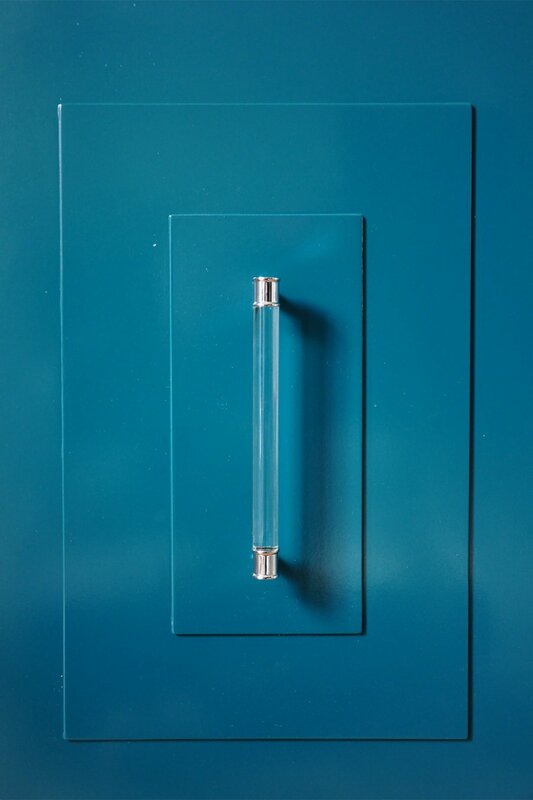 For this next piece I chose a super sleek pull from Hickory Hardware's "Skylight" collection. 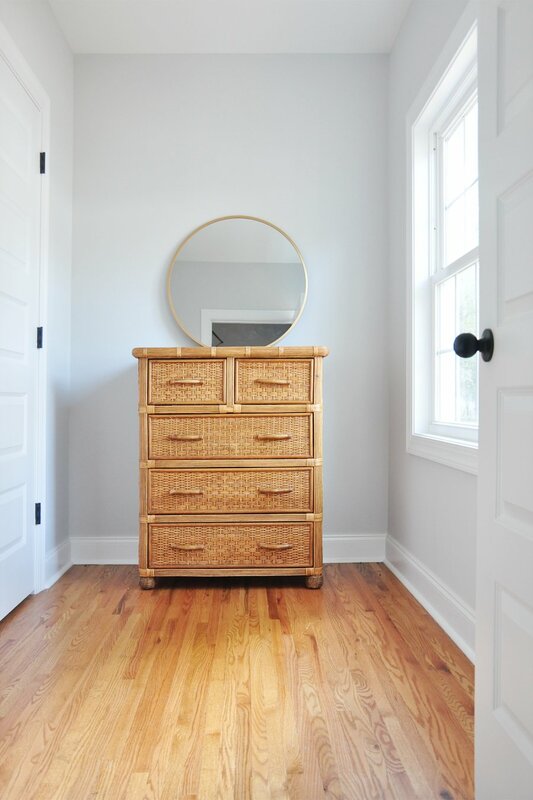 The golden nickel adds a modern contrast to the newly painted, rattan chest of drawers. 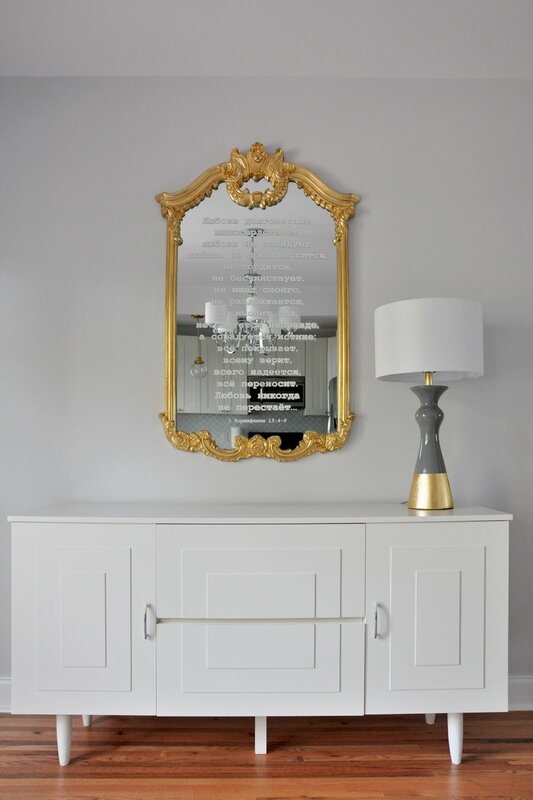 Mixing traditional elements with modern is how I prefer to decorate my entire house, and this Craigslist find nails that juxtaposition perfectly. 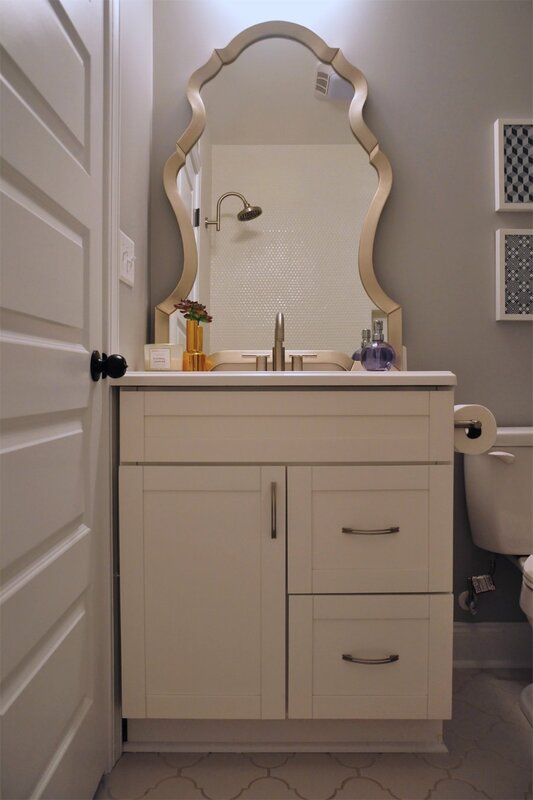 The guest bathroom vanity update features the "Streamline" collection pulls. 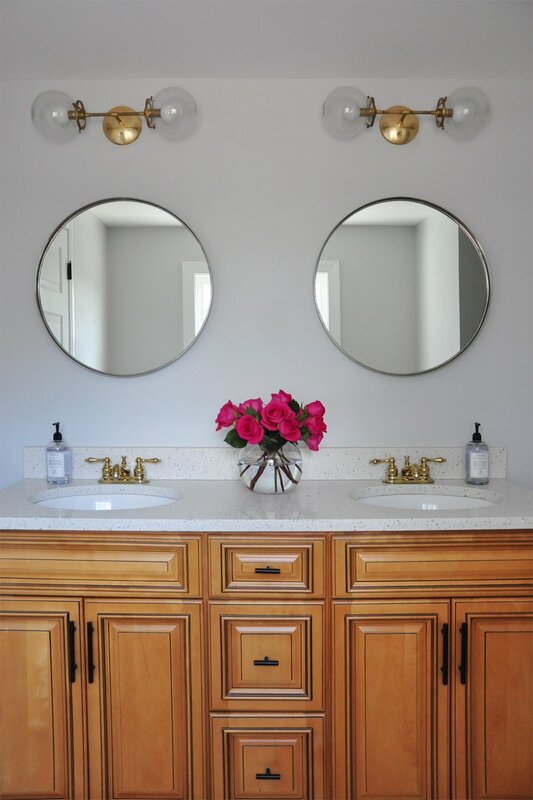 The vanity is as basic as they come; the shaker-style front leans towards the traditional – and so did the old pulls. 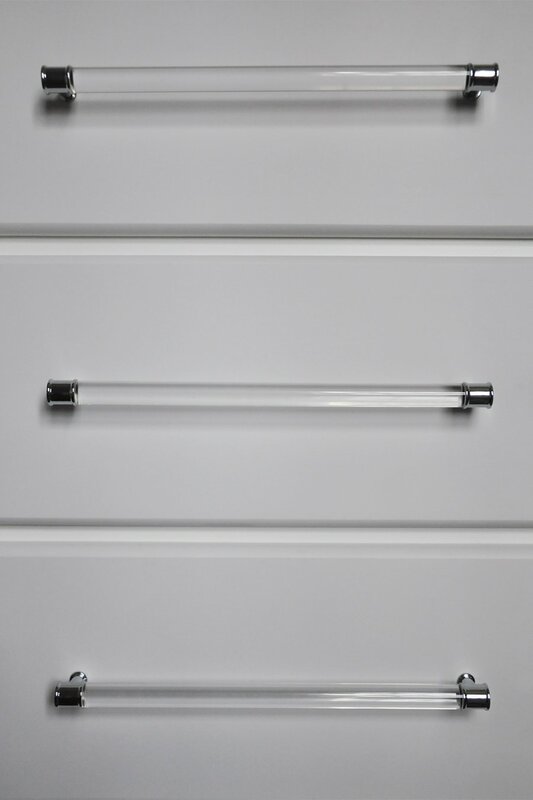 I wanted something more substantial, more sleek, and these minimalistic pulls are the perfect update. Here is another example of mixing modern and traditional styles. 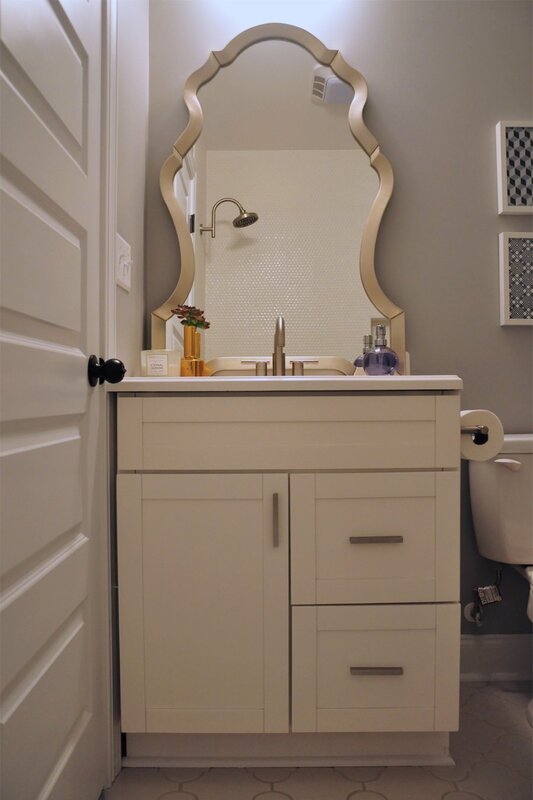 The 60-inch, quartz-top vanity from our master bathroom was another Craigslist find that we got for a whopping $250 (talk about a steal!). But the hardware on it was less than ideal. It totally dated the cabinets, and I knew the only way I'd be okay with the traditional design (without painting the entire thing) is if I update the hardware. I may still end up painting it (you know me...), but the hardware update alone does wonders for this space. 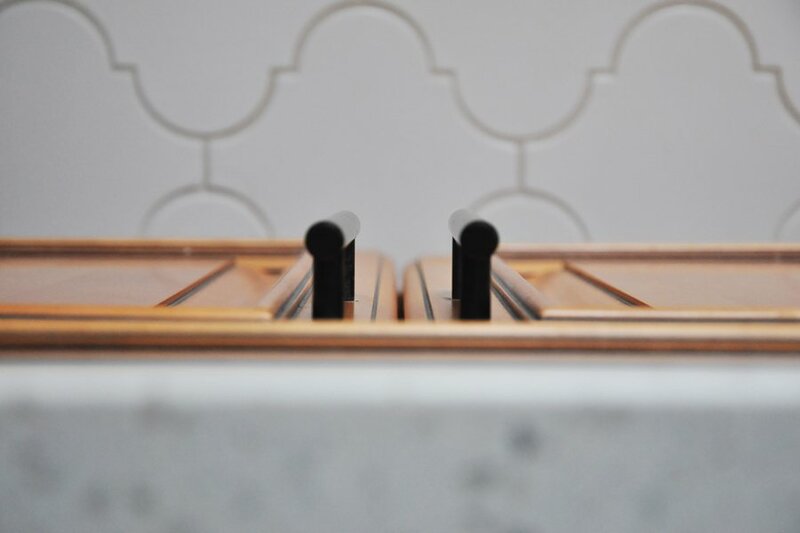 The streamlined "Bar" collection is a great choice because of its super contemporary and sleek design. I used matching T-knobs for the drawers. 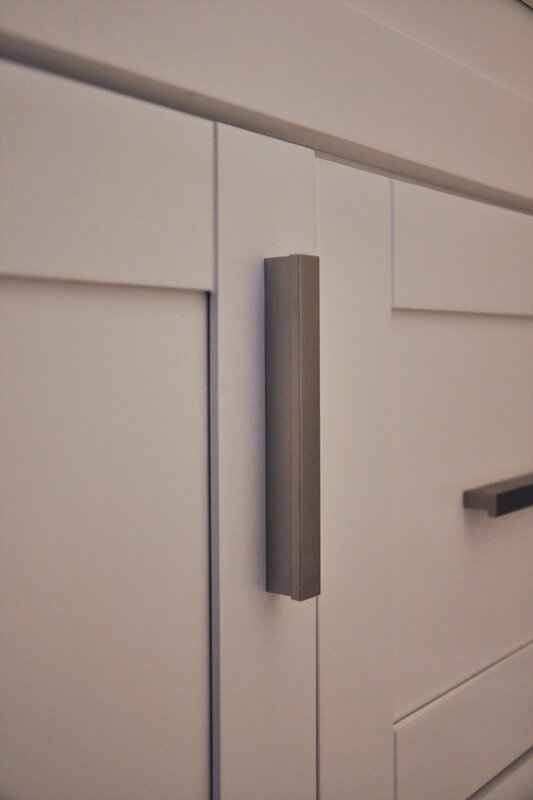 You know I have a thing for T-knobs; I installed them in our kitchen and the dresser in our master bedroom. Do you love or hate your current hardware? Which of the styles featured here do you like the most? Clearly, I had a favorite – ha! Posted in DIY PROJECTS, HOME DECOR and tagged DINING ROOM, GUEST BATHROOM, MASTER BATHROOM, MUDROOM, NURSERY.